Protectors of Children, Goddesses of Motherhood, Patrons of Easy Delivery, Bringer of Children. Japanese Buddhism & Shintoism Photo Dictionary. In Japan, there are many deities worshipped for their ability to bless couples with children, and to protect and save children from disaster. These guardians often appear as heroes in modern stories and cartoons. Most originated in Hindu myth and over time were incorporated into Buddhism, while others sprang from Japan’s indigenous Shinto tradition. Over the centuries, however, these traditions have merged, and many of the deities now share similar attributes. For example, the Shinto goddess Koyasu-sama, who grants easy childbirth, has Buddhist counterparts named Koyasu Kannon, Koyasu Jizo, and Jibo Kannon. Skt. = Hariti. Before becoming a Buddhist goddess, Kariteimo was the mother of demons. She symbolizes the selfish nature of mothers who go to terrible lengths to protect their children. Kariteimo had hundreds of children. To feed them, she kidnapped the babies of others and fed them to her own. But, after the Historical Buddha hid one of her children, she came to understand the pain and suffering she had caused countless parents and children. She repented, embraced Buddhism, and became a patron of children and child-giving goddess. Important to Nichiren sect. Details here. Kannon. Buddhist Goddess of Mercy. Comes in many forms. Five forms are closely associated with children and motherhood: Juntei Kannon (mother of the Buddhas), Koyasu Kannon (child-giving Kannon), Jibo Kannon (loving-mother Kannon), Mizuko Kannon (aborted children), and Maria Kannon (Christian origin). These forms have been merged with or confused with Kariteimo (see left column), or with the Shinto deity Koyasu-sama (goddess of easy childbirth), or with the Shinto water deity Suijin (see middle column). Details on this merging here. Koyasu-sama. Asama Shrines (also read "Sengen") are dedicated to the mythical princess Konohana Sakkuya Hime (also spelled Konohanasakuya; also known as Koyasu-sama), the Shinto deity of Mount Fuji, of cherry trees in bloom, and the goddess who grants easy childbirth. Legend contends she gave birth to a son while her house was devoured by flames. But after Buddhism gained a strong foothold in Japan, Koyasu-sama was largely supplanted by her Buddhist equivalents, known as Koyasu Kishibojin, Koyasu Kannon, Koyasu Jizo, and Jibo Kannon. For details on this Koyasu merging, please click here. Nonetheless, more than 1000 Asama Shrines still exist across Japan, with the head shrines standing at the foot and the summit of Mount Fuji itself. The Shinto deity of water and easy child, Suijin, also shares similar attributes as Koyasu-sama. 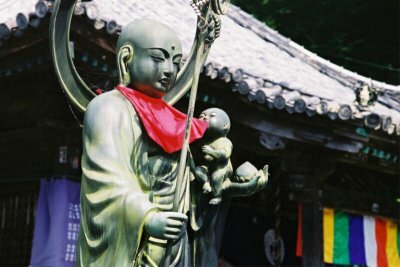 Jizo is the guardian of souls in hell and a popular protector of children, for Jizo works to ease the suffering and shorten the sentence of children serving time in Sai no Kawara, the river of souls in purgatory. Children in this realm pray for Buddha’s compassion by building small stone towers, piling stone upon stone. But an underworld demon soon arrives and scatters their stones and beats them with an iron club. No need to worry, though, for Jizo comes to the rescue. In one version of the story, Jizo hides the children in the sleeves of his robe. 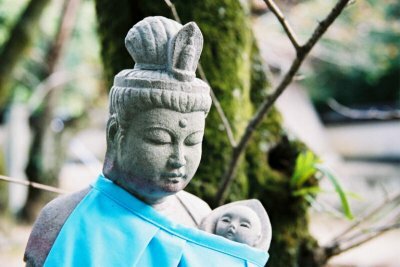 Two other forms of Jizo associated with children are Mizuko Jizo (protector of aborted children) and Koyasu Jizo (child-giving Jizo). The Buddhist goddess of music, poetry, learning, and art, also the goddess of the sea and protector of children. Benzaiten is sometimes associated with the Shinto deity Suijin/Suiten, the latter a goddess who protects fishermen and children. Both are closely associated with water (the ocean, rivers, lakes, and ponds). In Japan, Benzaiten is also closely associated with the dragon and snake. Enoshima island in Japan is of major importance to Benzaiten followers -- according to myth, she subdued a child-eating dragon who lived near here. She is worshipped widely in both Shinto and Buddhist traditions, and is the only female among Japan’s Seven Lucky Gods. Jibo 慈母 literally means "Compassionate Mother." Other common translations include Goddess of Motherly Love, Merciful Mother, or Affectionate Mother. 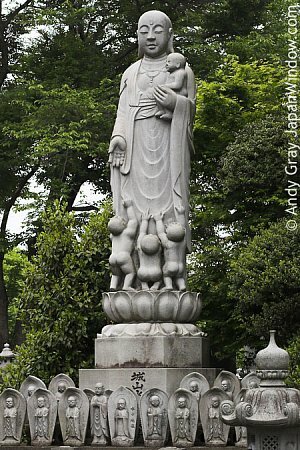 A feminine form of Kannon often depicted as a white-robed woman holding a babe in her arms. This iconography reportedly originated in China in the 14th and 15th century, where the deity was known as Songzi Guanyin 送子観音 (Child-Giving Guanyin), but did not make its way to Japan until the Tokugawa Era 徳川時代 (+1615-1867), when it was appropriated by the outlawed Christians, who hid their faith by venerating the Virgin Mary disguised as a statue of Jibo Kannon. Such statues are known as Maria Kannon. Thus, Jibo Kannon is a relative latecomer to Japan's Buddhist pantheon. More details and photos here. Shoki, the demon slayer. The story of Shoki was adopted from China, where he was known as Chung Kuei. During the Edo Period in Japan (1600-1868), families began to hang banners depicting Shoki inside and outside of their houses during the Boys' Day festival -- Tango no Sekku, May 5 each year, but now a festival for all children of both sexes. According to ancient tradition, this is a day when evil spirits and bad luck abounds. Images of Shoki ward off danger from the homes of families with male children. Hotei, one of Japan’s Seven Lucky Gods, is sometimes shown in artwork with children playing at his feet. He carries a bag which never empties, from which he gives gifts to children and the worthy. The warlike Sendan Kendatsuba uses his trident to skewer demons who attack children; origin from Indian mythology; a class of semi-divine beings who feed on the fragrance of herbs. They are also considered guardians of children. One of their kings, Sendan Kendatsuba, figures prominently in the Doujikyou Mandara. This deity is most prevalent among believers in Esoteric Buddhism. More details here. Monkeys are patrons of harmonious marriage and safe childbirth at some of the 3,800 Hie Jinja shrines in Japan. These shrines are dedicated to Sanno 山王 (lit. = Mountain King), the central deity of Japan’s Tendai Shinto-Buddhist multiplex based around Mt. Hiei (Shiga Prefecture, near Kyoto) and to Sanno’s messenger, Sanno Gongen 山王権現 (lit. = Mountain King Avatar), who is most often a monkey. Also known as Sarugami (猿神), the Shinto monkey kami to whom the three monkeys (hear, speak, see no evil) are faithful. Nakayama Shrine in Tsuyama City, Okayama Prefecture, appears in the Konjaku Monogatari-shu (今昔物語集, Heian Period). 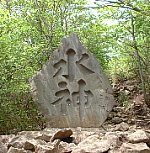 This shrine is considered, by some, to be the origin of Sarugami, who blesses couples with children, and is also known as the god of easy delivery and child rearing. For more details, please see the Monkey Pages. This deity was introduced to Japan from China by the priest Kuukai 空海 (774-835), and was invoked in rites especially for easy childbirth and for warding off the impurities associated with childbirth. In the Shingon and Zen sects, Ususama is also revered as the tutelary god of the toilet. Statue can be purchased online at above site. In Japan, Kangiten is worshipped as a central object of devotion. Kangiten symbolizes conjugal affection, and is thus prayed to by couples hoping for children. Statues of this deity are relatively rare in Japan -- most are kept hidden from public view and used in secretive rituals in which hot oil is poured over the image. Kangiten statues in Japan clearly reflect the deity's Hindu origins, for in India the deity is known as the elephant-headed Ganesha. In Japan, Kankiten is typically depicted with an elephant's head and human body, or as a pair of two-armed, elephant-headed deities in embrace. Photo courtesy Health Center Faculty of Medicine, Kagawa Univ. Please do not copy this page or photos into Wikipedia or elsewhere without proper citation !